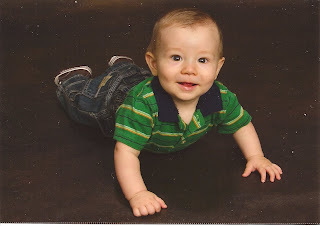 TRASK FAMILY: 7 MONTH PICS! 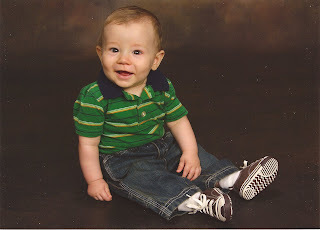 Went to JC Penny again to take pictures since I didn't make it at 6 months. He's getting so big, but boy do we love his smiles. He has so many different expressions, you know exactly what he's thinking. The funny part about this photo session was that, above he RARELY if ever puts his hands together, they are often flailing about sporting the nickname "octopus" from his dad, but ironically he put his hands together for a split second & smiled . . too funny. 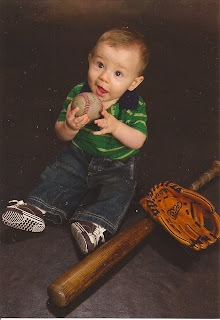 Then on the bottom, with the baseball equipment, he kept trying to put the ball in his mouth (no surprise), but succeeded a few times, which to Marks horror was the most disgusting thing he'd ever seen, considering that ball looks about 50 years old & has probably been used in the baby photo department since then. Oh well, some germs are good aren't they? 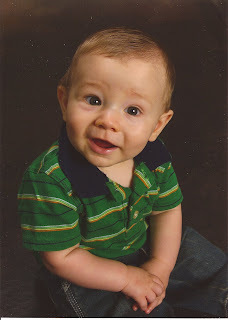 We love our little man! HE IS SO ADORABLE! When I looked at these pictures I couldn't help but smile! Isnt it SO fun to watch them grow and change. Time flies so fast when they are that young. FUN! What a cutie! These pictures are so cute! I'm surprised Mark is so aware of germs- most guys could care less!! His expression in that first picture is just priceless. . . and the hands. . . I love it! He is so handsome and getting so big.